Home » Blog » DOWN PAYMENT! How Much Is Enough? DOWN PAYMENT! How Much Is Enough? 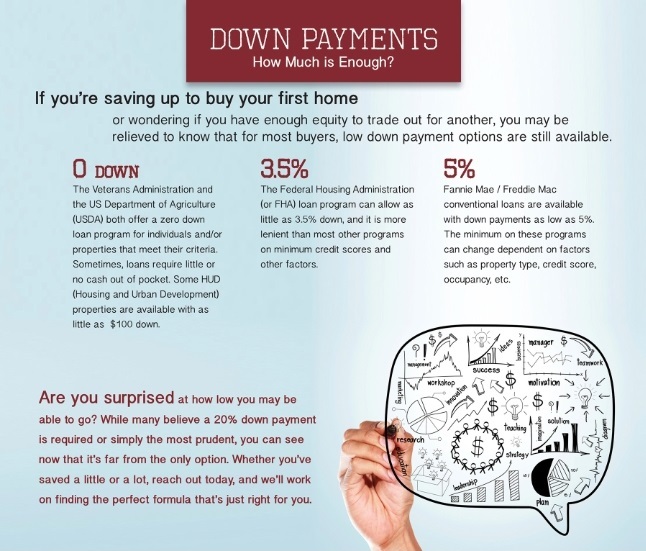 If you are saving up to buy your first house or wonder if you have enough equity to trade for another, you may be relieved to know that for most buyers there are still low down payment options available. $0 Down: VA (Veterans Administration) and USDA (US Department of Agriculture) both offer a zero down loan programs as long as you meet their criteria. The USDA Loans are an amazing option for buyers who are looking to put zero down and still get great rates and terms. The VA loans are also 0 down loan program as long as you meet their standards. 3.5% down: The federal housing administration (FHA) has been around for years and allows as little as 3.5% down. FHA Loans are also more lenient than most other programs and tolerate lower credit scores compared to many other programs. FHA also has an option for renovation (203K) which is a great loan to buy houses that need some TLC. 5% down: Fannie Mae /Freddie Mac conventional loans are available with down payments as low as 5% the minimum on these programs can depend on credit scores, income, property type and occupancy. 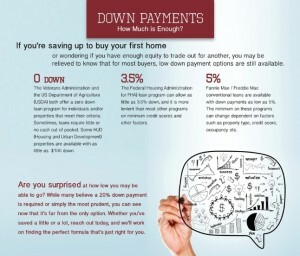 Are you surprised at how low some of these down-payments are? Some think the 20% is what takes to buy a house these days but with many different options available, it will make the dream of owning a house much easier. USA Mortgage offers a variety of programs, and we pride ourselves to offer many options along with the best rates and terms. Call or email us today to see which program will work best for you.